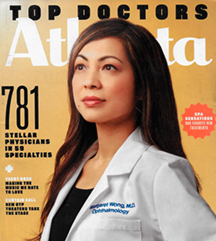 Atlanta magazine’s annual Top Doctors® issue has hit newsstands with seven Emory Eye Center physicians included. They are Maria Aaron, MD; Allen D. Beck, MD; Valérie Biousse, MD; Hans E. Grossniklaus, MD, MBA; G. Baker Hubbard III, MD; Nancy J. Newman, MD; and Ted H. Wojno, MD. The 2018 list includes 781 physicians representing 59 specialties. Many are associated with Emory: Emory Healthcare physicians, Emory Healthcare Network physicians, Emory University School of Medicine faculty and Emory medical staff physicians. Maria Aaron, MD, is a professor of ophthalmology within the Emory University School of Medicine and associate dean of graduate medical education. She served as the medical director for Emory Eye Center’s ophthalmology residency program for 14 years. Dr. Aaron’s clinical interests include adult comprehensive ophthalmology, diabetic retinopathy, and cataract surgery. The Emory Eye Center’s interim director and interim chair of ophthalmology, Allen D. Beck, MD, has been listed as one of America’s Top Doctors® for ten consecutive years. He is William and Clara Redmond Professor of Ophthalmology and former director of the department’s Glaucoma Section. Dr. Beck is an Emory trained physician whose clinical work focuses on the diagnosis and treatment of adult and pediatric glaucoma and the surgical treatment of cataracts. Valérie Biousse, MD, is Cyrus H. Stoner Professor of Ophthalmology at Emory Eye Center and sees patients in the Neuro-Ophthalmology Section. She holds a double appointment as a professor of ophthalmology and neurology in the Emory University School of Medicine. Dr. Biousse is interested in treating optic nerve disorders, vascular diseases of the eye, visual file defects, and disorders of ocular motility. Hans E. Grossniklaus, MD, MBA, is interim vice chair of Emory Eye Center; F. Phinizy Calhoun Jr. Professor of Ophthalmology; and director of the L.F. Montgomery Laboratory and the Ocular Oncology and Pathology Section. He is the recipient of some of the highest honors in ophthalmology, including the Zimmerman Medal from the American Association of Ophthalmic Oncologists and Pathologists in 2012 for outstanding contributions to ophthalmic pathology. His clinical practice specializes in ocular tumors and ocular pathology. G. Baker Hubbard III, MD, is Thomas M. Aaberg Professor of Ophthalmology, director of Emory Eye Center’s Retina Service and a member of the Ocular Oncology/Pathology Section. He also directs vitreoretinal surgery fellowship training at Emory University. Dr. Hubbard is highly recognized for his clinical work with pediatric retinal disorders, including retinopathy of prematurity and retinoblastoma. His primary research interest is in characterizing the clinical manifestations of pediatric retinal disorders and their treatment outcomes..
Nancy Newman, MD, is LeoDelle Jolley Professor of Ophthalmology and director of Emory Eye Center’s Neuro-Ophthalmology Section. She also is a professor of ophthalmology and neurology and instructor in neurological surgery at Emory University School of Medicine. Dr. Newman is internationally recognized as a distinguished teacher and researcher. Dr. Newman currently is the international principal investigator of a gene therapy trial in humans for LHON (Leber hereditary optic neuropathy), a blinding disorder preferentially affecting otherwise healthy young men. Ted H. Wojno, MD, is James and Shirley Kuse Professor of Ophthalmology and director of the Oculoplastics, Orbital and Cosmetic Surgery Section at Emory Eye Center. He joined Emory in 1985 as director of the newly-created Oculoplastics Section and directly trains all oculoplastics fellows through Emory University. Dr. Wojno treats adults and children with disorders of the eyelids, tear ducts and eye sockets, and is highly sought after for cosmetic and reconstructive surgery of the periocular structures and orbital tumors. His clinical research focuses on essential blepharospasm and orbital tumors. The publication’s “Top Doctors” list was compiled by the New York-based research firm Castle Connolly Medical Ltd., whose physician-led team of researchers follow a rigorous screening process to select doctors named to the list. Castel Connolly was founded in 1991. The survey and research process involves tens of thousands of top doctors and the medical leadership of prominent hospitals across the country. For the July 2018 “Top Doctors” feature, hundreds of Atlanta metro-area doctors were asked to name their most respected colleagues. The process sought nominations not only of physicians who excel in academic medicine and research but also those who exhibit excellence in patient care—those to whom nominating physicians would send their own families.